I react pragmatically. Where the market works, I'm for that. Where the government is necessary, I'm for that. I'm deeply suspicious of somebody who says, "I'm in favor of privatization," or, "I'm deeply in favor of public ownership." I'm in favor of whatever works in the particular case. 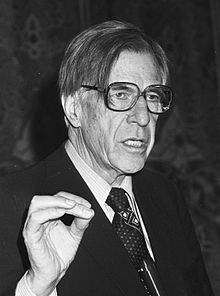 John Kenneth Galbraith (15 October 1908 – 29 April 2006) was a Canadian-American economist and author. The choice is between courses that are almost equally good or equally bad. It is the narrowest decisions that are most ardently debated. I believe the greatest error in economics is in seeing the economy as a stable, immutable structure. In the usual (though certainly not in every) public decision on economic policy, the choice is between courses that are almost equally good or equally bad. It is the narrowest decisions that are most ardently debated. If the world is lucky enough to enjoy peace, it may even one day make the discovery, to the horror of doctrinaire free-enterprisers and doctrinaire planners alike, that what is called capitalism and what is called socialism are both capable of working quite well. In the really hard cases you're choosing between the disastrous and the catastrophic, and it's hard to tell someone which one is which. People are the common denominator of progress. So, paucis verbis, no improvement is possible with unimproved people, and advance is certain when people are liberated and educated. It would be wrong to dismiss the importance of roads, railroads, power plants, mills, and the other familiar furniture of economic development. At some stages of development — the stage that India and Pakistan have reached, for example — they are central to the strategy of development. But we are coming to realize, I think, that there is a certain sterility in economic monuments that stand alone in a sea of illiteracy. Conquest of illiteracy comes first. Meetings are a great trap. … they are indispensable when you don't want to do anything. You will find that [the] State [Department] is the kind of organisation which, though it does big things badly, does small things badly too. Any country that has Milton Friedman as an adviser has nothing to fear from a few million Arabs. Increasingly in recent times we have come first to identify the remedy that is most agreeable, most convenient, most in accord with major pecuniary or political interest, the one that reflects our available faculty for action; then we move from the remedy so available or desired back to a cause to which that remedy is relevant. In the first place I identify this ["the equilibrium of poverty"] with primitive agriculture, and two factors have been at work there. One is, of course, population growth. If you were a poor farmer in India, Pakistan, or in much of Africa, you would want as many sons as possible as your social security. They would keep you out of the hot sun and give you some form of subsistence in your old age. So, you have pressure for population growth that is, itself, the result of the extreme economic insecurity. This is something which hasn't been sufficiently emphasized. One must always have in mind one simple fact — there is no literate population in the world that is poor, and there is no illiterate population that is anything but poor. When you see reference to a new paradigm you should always, under all circumstances, take cover. Because ever since the great tulipmania in 1637, speculation has always been covered by a new paradigm. There was never a paradigm so new and so wonderful as the one that covered John Law and the South Sea Bubble — until the day of disaster. Let's begin with capitalism, a word that has gone largely out of fashion. The approved reference now is to the market system. This shift minimizes — indeed, deletes — the role of wealth in the economic and social system. And it sheds the adverse connotation going back to Marx. Instead of the owners of capital or their attendants in control, we have the admirably impersonal role of market forces. It would be hard to think of a change in terminology more in the interest of those to whom money accords power. They have now a functional anonymity. Hitler also anticipated modern economic policy . . . by recognizing that a rapid approach to full employment was only possible if it was combined with wage and price controls. That a nation oppressed by economic fear would respond to Hitler as Americans did to F.D.R. is not surprising. The drive toward complex technical achievement offers a clue to why the US is good at space gadgetry and bad at slum problems. In the autumn of 1929 the mightiest of Americans were, for a brief time, revealed as human beings. Writing is a long and lonesome business; back of the problems in thought and composition hover always the awful questions: Is this the page that shows the empty shell? Is it here and now that they find me out? I never enjoyed writing a book more; indeed, it is the only one I remember in no sense as a labor but as a joy. SOME YEARS, like some poets,and politicians and some lovely women, are singled out for fame far beyond the common lot, and 1929 was clearly such a year. This view that the action of the Federal Reserve authorities in 1927 was responsible for the speculation and collapse which followed has﻿ never been seriously shaken. There are reasons why it is attractive. It is simple, and it exonerates both the American people and the economic system from substantial blame... Yet the explanation obviously assumes that people will always speculate if only they can get the money to finance it. Nothing could be farther from the case. There were times before and there has been long periods since when credit was plentiful and cheap -- far cheaper than in 1927-29 -- and when speculation was negligible. Nor was speculation out of control after 1927, except that it was beyond the reach of men who did not want in the least to control it. The explanation is a tribute only to a recurrent preference, in economic matters, for formidable nonsense. Of all the weapons in the Federal Reserve arsenal, words were the the most unpredictable in their consequences. In 1929 the discovery of the wonders of the geometric series struck Wall Street with a force comparable to the invention of the wheel. To a few alarmed observers it seemed as though Wall Street were by way of devouring all the money of the entire world. However, in accordance with the cultural practice, as the summer passed, the sound and responsible spokesmen decried not the increase in brokers' loans, but those who insisted on attaching significance to this trend. It was not hard to persuade people that the market was sound; as always in such times they asked only that the disturbing voices of doubt be muted and that there be tolerably frequent expressions of confidence. The values of a society totally preoccupied with making money are not altogether reassuring. However, it is safe to say that at the peak in 1929 the number of active speculators was less — and probably was much less — than a million. In these maters, as often in our culture, it is far, far better to be wrong in a respectable way than to be right for the wrong reasons. Of all the mysteries of the stock exchange there is none so impenetrable as why there should be a buyer for everyone who seeks to sell. No one knew, but it cannot be stressed too frequently, that for effective incantation knowledge is neither necessary nor assumed. The Coolidge Bull market was a remarkable phenomenon. The ruthlessness of its liquidation was, in its own way, equally remarkable. To the man who held stock on margin, disaster had only one face and that was falling prices. But now prices were to be allowed to fall. The speculator's only comfort, henceforth, was that his ruin would be accomplished in an orderly and becoming manner. Our political life favors the extremes of speech; the man who is gifted in the arts of abuse is bound to be a notable, if not always a great figure. The market had reasserted itself as an impersonal force beyond the power of any person to control, and, while this is the way markets are supposed to be, it was horrible. Despite a flattering supposition to the contrary, people come readily to terms with power. There is little reason to think that the power of the great bankers, while they were assumed to have it, was much resented. But as the ghosts of numerous tyrants, from Julius Caesar to Benito Mussolini will testify, people are very hard on those who, having had power, lose it or are destroyed. Then anger at past arrogance is joined with contempt for the present weakness. The victim or his corpse is made to suffer all available indignities. A banker need not be popular; indeed a good banker in a healthy capitalist society should probably be much disliked. People do not wish to trust their money to a hail-fellow-well-met but to a misanthrope who can say no. Men have been swindled by other men on many occasions. The autumn of 1929 was, perhaps, the first occasion when men succeeded on a large scale in swindling themselves. Clerks in downtown hotels were said to be asking guests whether they wished the room for sleeping or jumping. Two men jumped hand-in-hand from a high window in the Ritz. They had a joint account. One of the uses of depression is the exposure of what auditors fail to find. Men meet together for many reasons in the course of business. They need to instruct or persuade each other. They must agree on a course of action. They find thinking in public more productive or less painful than thinking in private. But there are at least as many reasons for meetings to transact no business. Meetings are held because men seek companionship or, at a minimum, wish to escape the tedium of solitary duties. They yearn for the prestige which accrues to the man who presides over meetings, and this leads them to convoke assemblages over which they can preside. Finally, there is the meeting which is called not because there is business to be done, but because it is necessary to create the impression that business is being done. Such meetings are more than a substitute for action. They are widely regarded as action. In the early days of the crash it was widely believed that Jesse L. Livermore, a Bostonian with a large and unquestionably exaggerated reputation for bear operations, leading a syndicate that was driving the market down. However, Hoover had converted the simple business ritual of reassurance into a major instrument of public policy. Our political tradition sets great store by the generalized symbol of evil. This is the wrongdoer whose wrongdoing will be taken by the public to be the secret propensity of a whole community or class. Wall Street's crime, in the eyes of its classical enemies, was less its power than its morals. In accordance with an old but not outworn tradition, it might now be wise for all to conclude that crime, or even misbehavior, is the act of an individual, not the predisposition of a class. Moreover, regulatory bodies, like the people who comprise them, have a marked life cycle. In youth they are vigorous, aggressive, evangelistic, and even intolerant. Later they mellow, and in old age — after a matter of ten or fifteen years — they become, with some exceptions, either an arm of the industry they are regulating or senile. The fact was that American enterprise in the twenties had opened its hospitable arms to an exceptional number of promoters, grafters, swindlers, impostors, and frauds. Both of these measures were on the side of increasing spendable income, though unfortunately they were largely without effect. The tax reductions were negligible except in the higher income brackets; businessmen who promised to maintain investment and wages, in accordance with a well-understood convention, considered the promise binding only for the period within which it was not financially disadvantageous to do so. The advisers and counselors were not, however, analyzing the danger or even the possibility. They were serving only as the custodians of bad memories. And after they have started the action will always look, as it did to the frightened men in the Federal Reserve Board in February 1929, like a decision in favor of immediate as against ultimate death. As we have seen, the immediate death not only has the disadvantage of being immediate but of identifying the executioner. At best, in such depression times, monetary policy is a feeble reed on which to lean. But there is still a considerable difference between a failure to do enough that is right and a determination to do much that is wrong. But now, as throughout history, financial capacity and political perspicacity are inversely correlated. Long run salvation by men of business has never been highly regarded if it means disturbance of orderly life and convenience in the present. So inaction will be advocated in the present even though it means deep trouble in the future. Here, at least equally with communism, lies the threat to capitalism. It is what causes men who know that things are going quite wrong to say that things are fundamentally sound. Authorship of any sort is a fantastic indulgence of the ego. It is well no doubt, to reflect on how much one owes to others. Even the word depression itself was the terminological product of an effort to soften the connotation of deep trouble. In the last century, the term crisis was normally employed. With time, however, this acquired the connotation of the misfortune it described. Marx profoundly affected those who did not accept his system. His influence extended to those who least supposed they were subject to it. The massive reduction in risk that is inherent in the development of the modern corporation has been far from fully appreciated. We do not manufacture wants for goods we do not produce. One man's consumption becomes his neighbor's wish. It is in the long run that the corporation lives. Very important functions can be performed very wastefully and often are. The family which takes its mauve and cerise, air conditioned, power-steered, and power braked automobile out for a tour passes through cities that are badly paved, made hideous by litter, blighted buildings, billboards, and posts for wires that should long since have been put underground. In a community where public services have failed to keep abreast of private consumption things are very different. Here, in an atmosphere of private opulence and public squalor, the private goods have full sway. Simple minds, presumably, are the easiest to manage. "Poverty" Pitt exclaimed "is no disgrace but it is damned annoying." In the contemporary United States it is not annoying but it is a disgrace. Only men of considerable vanity write books; consistently therewith, I worried lest the world were exchanging an irreplaceable author for a more easily purchased diplomat. By all but the pathologically romantic, it is now recognized that this is not the age of the small man. Only in very recent times has the average man been a source of savings. In the assumption that power belongs as a matter of course to capital, all economists are Marxians. There is no name for all who participate in group decision-making or the organization which they form. I propose to call this organization the Technostructure. The size of General Motors is in the service not of monopoly or the economies of scale but of planning. Men are, in fact, either sustained by organization or they sustain organization. Economic theory is the most prestigious subject of instruction and study. Agricultural economics, labor economics and marketing are lower caste fields of study. The notion of a formal structure of command must be abandoned. It is more useful to think of the mature corporation as a series of concentric circles. While it will be desirable to achieve planned results, it will be even more important to avoid unplanned disasters. THE INDUSTRIAL SYSTEM requires that prices be under effective control. And it seeks the greatest possible influence over what buyers take at the established prices. To add to the technostructure is to increase its power in the enterprise. In fact, the wage-price spiral is the functional counterpart of unemployment. The latter occurs when there is insufficient demand; the spiral operates when there is too much and also,unfortunately, when there is just enough. The first goal of the technostructure is its own security. The overall effect of the rise of the industrial system is greatly to reduce the union as a social force. But it will not disappear or become entirely unimportant. A drastic reduction in weapons competition following a general release from the commitment to the Cold War would be sharply in conflict with the needs of the industrial system. Educators have yet to realize how deeply the industrial system is dependent upon them. Nothing in our time is more interesting than the erstwhile capitalist corporation and the erstwhile Communist firm should, under the imperatives of organization, come together as oligarchies of their own members. No grant of feudal privilege has ever equaled, for effortless return, that of the grandparent who bought and endowed his descendants with a thousand shares of General Motors or General Electric. But it can be laid down as a rule that those who speak most of liberty are least inclined to use it. The Senate has unlimited debate; in the House, debate is ruthlessly circumscribed. There is frequent discussion as to which technique most effectively frustrates democratic process. However, a more important antidote to American democracy is American gerontocracy. The positions of eminence and authority in Congress are allotted in accordance with length of service, regardless of quality. Superficial observers have long criticized the United States for making a fetish of youth. This is unfair. Uniquely among modern organs of public and private administration, its national legislature rewards senility. The traveler to the United States will do well, however, to prepare himself for the class-consciousness of the natives. This differs from the already familiar English version in being more extreme and based more firmly on the conviction that the class to which the speaker belongs is inherently superior to all others. Once the visitor was told rather repetitively that this city was the melting pot; never before in history had so many people of such varied languages, customs, colors and culinary habits lived so amicably together. Although New York remains peaceful by most standards, this self-congratulation is now less often heard, since it was discovered some years ago that racial harmony depended unduly on the willingness of the blacks (and latterly the Puerto Ricans) to do for the other races the meanest jobs at the lowest wages and then to return to live by themselves in the worst slums. When the modern corporation acquires power over markets, power in the community, power over the state and power over belief, it is a political instrument, different in degree but not in kind from the state itself. To hold otherwise — to deny the political character of the modern corporation — is not merely to avoid the reality. It is to disguise the reality. The victims of that disguise are those we instruct in error. The beneficiaries are the institutions whose power we so disguise. Let there be no question: economics, so long as it is thus taught, becomes, however unconsciously, a part of the arrangement by which the citizen or student is kept from seeing how he or she is, or will be, governed. The decisive weakness in neoclassical and neo-Keynesian economics is not the error in the assumptions by which it elides the problem of power. The capacity for erroneous belief is very great, especially where it coincides with convenience. Rather, in eliding power — in making economics a nonpolitical subject — neoclassical theory destroys its relation to the real world. In that world, power is decisive in what happens. And the problems of that world are increasing both in number and in the depth of their social affliction. In consequence, neoclassical and neo-Keynesian economics is relegating its players to the social sidelines where they either call no plays or use the wrong ones. To change the metaphor, they manipulate levers to which no machinery is attached. This is what economics now does. It tells the young and susceptible (and also the old and vulnerable) that economic life has no content of power and politics because the firm is safely subordinate to the market and the state and for this reason it is safely at the command of the consumer and citizen. Such an economics is not neutral. It is the influential and invaluable ally of those whose exercise of power depends on an acquiescent public. If the state is the executive committee of the great corporation and the planning system, it is partly because neoclassical economics is its instrument for neutralizing the suspicion that this is so. A constant in the history of money is that every remedy is reliably a source of new abuse. The pioneering instrument of reform was the Bank of England. Of all institutions concerned with economics none has for so long enjoyed such prestige. It is, in all respects, to money as St. Peter's is to Faith. In 1736, Franklin's Pennsylvania Gazette printed an apology for its irregular appearence because its printer was "with the Press, labouring for the publick Good, to make Money more plentiful." The press was busy printing money. Why is anything intrinsically so valueless so obviously desirable? In numerous years following the war the Federal government ran a heavy surplus. It could not pay off it's debt, retire its securities, because to do so meant there would be no bonds to back the national bank notes. To pay off the debt was to destroy the money supply. Seaboard Air Line, which was thought by numerous innocents to provide a foothold in aviation, was another favorite, although, in fact, it was a railroad. The foresight of financial experts was, as so often, a poor guide to the future. 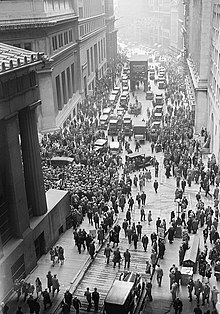 There was something superficial in attributing anything so awful as the Great Depression to anything so insubstantial as speculation in common stocks. Chapter XIV, When The Money Stopped, p. 183-184. What was needed was a policy that increased the supply of money available for use and then ensured its use. Then the state of trade would have to improve. Foresight is an imperfect thing — all prevision in economics is imperfect. With the American failure came world failure. Those who yearn for the end of capitalism should pray for government by men who believe that all positive action is inimical to what they call thoughtfully the fundamental principles of free enterprise. Few things in life can be so appalling as the difference between a dry antiseptic statement of a principle by a well spoken man in a quiet office, and what happens to people when that principle is put into practice. Ideas may be superior to vested interest. They are also very often the children of vested interest. It's a rule worth having in mind. Income almost always flows along the same axis as power but in the opposite direction. American university presidents are a nervous breed; I have never thought well of them as a class. The masters thought they were loved until one day one of their favorites farted loudly while serving dinner and the next day was gone. The very first manifestation of the classless society is the disappearance of the servant class. I've long believed alas, that in highly organized industrial societies, capitalist or socialist, the stronger tendency is to converge — that if steel or automobiles are wanted and must be made on a large scale, the process will stamp its imprint on the society, whether that me be Magnitogorsk or Gary, Indiana. All successful revolutions are the kicking in of a rotten door. The violence of revolutions is the violence of men who charge into a vacuum. It was in World War I that the age-old certainties were lost. Until then aristocrats and capitalists felt secure in their position, and even socialists felt certain in their faith. It was never to be so again. The Age of Uncertainty began. Who is king in the world of the blind when there isn't even a one eyed man? Few can believe that suffering, especially by others, is in vain. Anything that is disagreeable must surely have beneficial economic effects. The myth that holds that the great corporation is the puppet of the market, the powerless servant of the consumer, is, in fact one of the devices by which its power is perpetuated. But there is merit even in the mentally retarded legislator. He asks the questions that everyone is afraid to ask for fear of seeming simple. A nuclear war does not defend a country and it does not defend a system. I've put it the same way many times; not even the most accomplished ideologue will be able to tell the difference between the ashes of capitalism and the ashes of communism. Get the process of negotiation away from the small specialized group that some people have called the "nuclear theologians," who in effect said this is a complicated issue of seeing how little we can give away, how much we can extract from the other side; it's highly specialized. Only a few people can understand the nature of these weapons, the delivery systems, the targeting, the nature of the MIRV and the CRUISE, on down, and the MX. This kept the whole discussion to a very limited group of people who, in a way, had assumed responsibility for saying whether we should live or die. The huge capacity to purchase submission that goes with any large sum of money, well, this we have. This is a power of which we should all be aware. 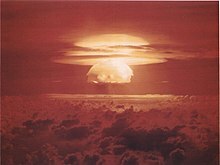 Both we and the Soviets face the common threat of nuclear destruction and there is no likelihood that either capitalism or communism will survive a nuclear war. Excessive acreages of unused buildings, commercial and residential were created. The need for such construction, given the space demands of modern business bureaucracy, was believed to be without limit. In later consequence, the solvency of numerous banks, including that of some of the nation's largest and most prestigious institutions, was either fatally impaired or placed in doubt. The lending of both those that failed or were endangered and others was subject, by fear and example to curtailment. The construction industry was severely constrained and its workers left unemployed. A general recession ensued. Any early warning as to what was happening would have been exceptionally ill received, seen as yet another invasion of the benign rule of laissez faire and a specific interference with the market. However in keeping with the exceptions to this rule, there would be eventual salvation in a government bailout of the banks. Insurance of bank deposits — a far from slight contribution to contentment — was permissible, as well as assurance that were a bank large enough, it would not be allowed to fail. A preventive role by government was not allowed; eventual government rescue was highly acceptable. I was studying agriculture, how to produce better chickens, better cattle, better horses — horses in those days — better fruit, better vegetables. This was in the early years of the Great Depression, and the thoughts crossed my mind that there wasn't a hell of a lot of use producing better crops and better livestock if you couldn't sell them, that the real problem of agriculture was not efficiency in production but the problem of whether you could make money after you produced the stuff. So I shifted from the technical side to, first, the study of agricultural economic issues and then on to economics itself. Broadly speaking, [Keynesianism means] that the government has a specific responsibility for the behavior of the economy, that it doesn't work on its own autonomous course, but the government, when there's a recession, compensates by employment, by expansion of purchasing power, and in boom times corrects by being a restraining force. But it controls the great flow of demand into the economy, what since Keynesian times has been the flow of aggregate demand. That was the basic idea of Keynes so far as one can put it in a couple of sentences. Going back to the most ancient times, national well-being, the national prestige depended on territory. The more territory a country had, the more income revenue there was, the more people there were to be mobilized for arms strength. So we had an enormous sense of territorial conflict and territorial integrity, and that was unquestionably a part of the cause of war, coupled with the fact that there was a disposition in that direction by the landed class, a disposition to think of territorial acquisition and territorial defense and to think of the peasantry as a superior form of livestock which could be used for arms purposes. I react to what is necessary. I would like to eschew any formula. There are some things where the government is absolutely inevitable, which we cannot get along without comprehensive state action. But there are many things — producing consumer goods, producing a wide range of entertainment, producing a wide level of cultural activity — where the market system, which independent activity is also important, so I react pragmatically. Where the market works, I'm for that. Where the government is necessary, I'm for that. I'm deeply suspicious of somebody who says, "I'm in favor of privatization," or, "I'm deeply in favor of public ownership." I'm in favor of whatever works in the particular case. I write with two things in mind. I want to be right with my fellow economists. After all, I've made my life as a professional economist, so I'm careful that my economics is as it should be. But I have long felt that there's no economic proposition that can't be stated in clear, accessible language. So I try to be right with my fellow economists, but I try to have an audience of any interested, intelligent person. Though often attributed to Galbraith, as early as 1988 in U.S. News & World Report, the earliest publications of this statement, in The Bulletin (1984) and Reader's Digest (1985) attributes it to Ezra Solomon. In the mid-1960s, I was a typical left-wing undergraduate student at Caltech. For any social problem that arose, I had no doubt that the appropriate cure involved some form of government intervention. So, naturally, Galbraith was my hero, and I was therefore greatly ex cited when he came to my school in 1964 to give a speech in support of Lyndon Johnson’s campaign for the presidency. I confess that I cannot remember a lot of the details of the speech, but I know that I was disappointed. In particular, I recall feeling that his arguments for bigger government were not compelling. No doubt, this event started me on the road to doubting the wisdom of governmental activism and appreciating the wonders of free markets. When I discussed this experience with Ken after more than thirty years, his surprising reaction was to apologize for what must have been a bad speech. 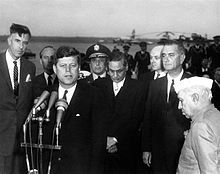 He said that he especially regretted his endorsement of Lyndon Johnson, who was later to become anathema to liberals because of his pursuit of the Vietnam War. If it had been me, I would have apologized mainly for Johnson’s Great Society programs. If there were justice in the world, John Kenneth Galbraith would rank as the twentieth century’s most influential American economist. He has published several books that are among the best analyses of modern US history , played a key role in midcentury policymaking, and advised more presidents and senators than would seem possible in three lifetimes. Yet today, Galbraith’s influence on economics is small, and his influence on US politics is receding by the year. Galbraith propounded no such easily summarized doctrine. The closest we can get is: "the world is complicated, and both right-wing ideology and the conventional wisdom that is this age's self-image are terribly wrong." He offered critiques that required you to read and understand old theories, not new theories that allowed you to dismiss everything prior as irrelevant. The result? Nearly all economists today are Paul Samuelson's children. Many are Keynes' children. Friedman, Robert Lucas, Robert Solow, and James Tobin all have plenty of descendants. But there are few Galbraithians on the ground. Would economics as a discipline be stronger if the 50-year-old and 30-year-old economists had a better appreciation of Galbraith? Almost surely. Will the winds of economic fashion shift and cause economists to appreciate Galbraith once again? For that to happen, an astute young economist would have to devote himself to "mathing up" chapters of The Affluent Society and The New Industrial State and publishing them in journals -- not a likely prospect in today's risk-adverse academic environment. The general educated—the public that watches McNeil/Lehrer or read The New Yorker—thinks of Galbraith as an important economic thinker. Although Galbraith is a Harvard economics professor, however, he has never been taken seriously by his academic colleagues, who regard him as more of a “media personality”. The contrast between public and professional perception became particularly acute in 1967, when Galbraith made a grand statement of his ideas about economics in The New Industrial State, a book that he hoped would come to be regarded as being in the same league as John Maynard Keynes’s General Theory or even Adam Smith’s Wealth of Nations. The book was rapturously reviewed in the popular press, but it met with indifference from the academics. Galbraith’s book wasn’t what they considered real economic theory. Not incidentally, the academics were right in believing that The New Industrial State could be safely ignored. The example of Galbraith is not an accidental one: in many ways, Galbraith broke important new ground in the relationship between politics and economics. He was the first celebrity economist (where the definition of a celebrity is the usual one: someone who is famous for being famous). His rise as a policy entrepreneur was one marker of the growing dominance of style (which he has in abundance) over substance in American political discourse, even among those who image themselves to be well informed about public affairs. So Galbraith is oblivious to the most serious problem facing modern liberalism: reconciling social justice with full employment. In the real world this is a terrible dilemma; even Sweden, with its powerful sense of community and overwhelming consensus for the welfare state, has found itself suffering from an acute case of Eurosclerosis. But in Galbraith's world there is no dilemma at all: Unemployment is merely a problem of inadequate demand, to be cured by New Deal-type public works programs and redistribution of income away from rich people who save too much. If Walter Bagehot was right that “one of the greatest pains to human nature is the pain of a new idea,” Ken caused an extraordinary amount of pain. Both in his economic thinking and in his political activities, he was dedicated to resisting, and where possible overturning, what he famously called “conventional wisdom” (one of his many turns of phrase that have since become commonplace locutions). Rejecting the standard economic theory based on small, anonymous households and firms that autonomously engage in perfectly functioning markets, Ken instead saw an economic stage dominated by large, nameable actors: big business, big labor, big government. Sorting out their roles and respective power was central to his analysis, and the continually shifting tensions in the interplay among them—“countervailing power” in another of his deft phrases—was the real story of how an economy behaved. Ken also identified the corporation, not “the market,” as the defining institution of modern economic activity, developing these and related themes both in his teaching and in such widely celebrated books as American Capitalism (1952) and The New Industrial State (1967). But his interest in these ideas persisted throughout his life. The central importance of the corporation, and the fear that government was no longer able to provide an adequate countervailing force against corporate influence exerted both legally and otherwise, was the subject of his last book, The Economics of Innocent Fraud (2004). An economist such as John Galbraith is as much a political scientist as Robert Dahl or David Truman. I knew Galbraith in the old days; he sat for some little time in my seminar. I must say I am not altogether surprised at what has happened; for I have always thought him a dull fellow, well intentioned enough, but a sort of pedant of New Deal economics — just the kind of man to upset the business community without himself bringing any startling administrative ability to offset the loss of that which he had antagonized. Political economy is an art as well as a science. John Kenneth Galbraith has always been a creative artist in formulating theories of the social world. His fabrications constitute the stuff of economic science. His is an artistic, speculative mind. He sets up hypotheses which go beyond the data, and some of the greatest scholars in history have been of that type, … Part of Galbraith's strength is that he writes well. Some economists believe writing well is a defect that creates too much spurious impact on thought. If it's a crime, it's not one that many of my profession are guilty of. He doesn't get enough praise. The Affluent Society is a great insight, and has become so much a part of our understanding of contemporary capitalism that we forget where it began. It's like reading Hamlet and deciding it's full of quotations. Galbraith has often been compared to Keynes, and they had much in common. But the way they did their economics was very different. Keynes produced theories, Galbraith, theoretically-inspired sociology. Keynes thought that ideas ruled the roost; Galbraith thought it was structures of power. His was a non-Marxist version of class struggle, with the intelligentsia as the engine of social innovation and carrier of the "public purpose". What Galbraith understood, and what later researchers (including this author) have proved, is that Adam Smith's "invisible hand" – the notion that the individual pursuit of maximum profit guides capitalist markets to efficiency – is so invisible because, quite often, it's just not there. Unfettered markets often produce too much of some things, such as pollution, and too little of other things, such as basic research. As Bruce Greenwald and I have shown, whenever information is imperfect – that is, always – markets are inefficient; hence the need for government action. Galbraith's penetrating insights into the nature of capitalism – as it is lived, not as it is theorized in simplistic models – has enhanced our understanding of the market economy. He has left an intellectual legacy for generations to come. "John Kenneth Galbraith, 97, Dies; Economist Held a Mirror to Society". The New York Times. April 30 2006.